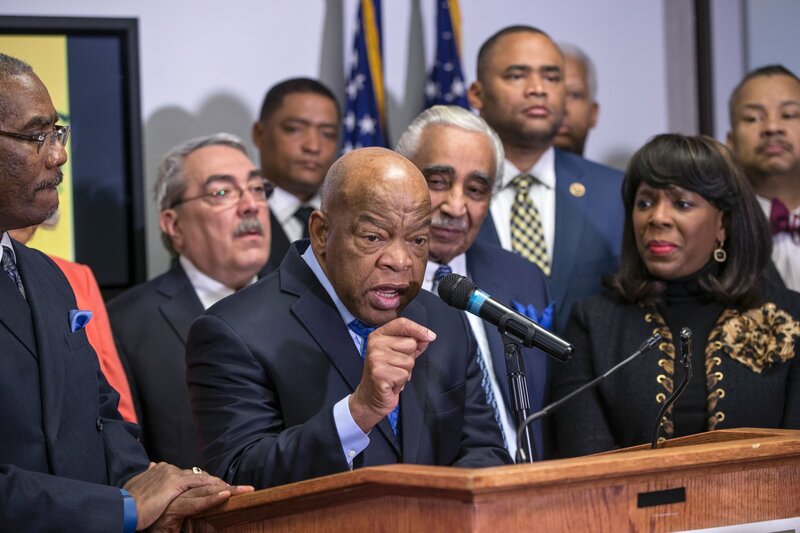 The Congressional Black Caucus Political Action Committee (CBC PAC) has endorsed Hillary Clinton’s presidential campaign, and by the way in which it did so has demonstrated its propensity to play establishment politics. An endorsement in itself isn’t a bad thing, but for the CBC PAC to endorse the Clinton campaign by misleading black voters about Bernie Sanders’ record on issues important to black Americans, and neglecting to offer any critique on the impacts the Clinton policies have had on black Americans is not only insulting, it’s dishonest. According to South Carolina House Democratic Leader J. Todd Rutherford, Bernie Sanders has “only really started talking about issues concerning African Americans in the last 40 days.” Rutherford has also criticized Bernie Sanders for his vote in favor of the 1994 Violent Crime Control and Law Enforcement Act, and suggested that Bernie Sanders apologize for his vote on the bill. Perhaps Bernie Sanders should apologize for voting in favor of the crime bill, and if he does he should do so with the 24 members of the Congressional Black Caucus who also voted for the bill in 1994. A critique can be made about Sanders’ vote in favor of the crime bill; however, that critique must be put into the context of his support for women who are victims of domestic violence, which is part of the reason he voted in favor of the crime bill: The Violence Against Women Act was attached to it. Here is a video of Bernie Sanders addressing the crime bill, domestic violence, and The Violence Against Women Act. Bernie Sanders strongly opposed the crime bill, and addressed congress in a two-minute speech in which he called the bill a “punishment bill”, and went on to say he had a “problem with a president, and a congress” that wants to get “tough on crime” while millions of people go hungry and children sleep outside on the streets. He ended his opposition to the crime bill with the saying, “let’s not keep putting poor people into jail and disproportionately punishing blacks”—that was 8,880 days ago. Here is a clip from C-Span of Bernie Sanders’ remarks at the 1994 Congressional Black Caucus hearing on crime and guns in African-American communities. At the beginning of the clip, Bernie Sanders is introduced by the chairman of the Congressional Black Caucus as “a colleague and associate member of the Congressional Black Caucus”. In his remarks, Sanders would go on to say that addressing crime without addressing poverty and jobs is “absurd”—that was 8,066 days ago. Here is a compilation of Bernie Sanders’ consistency on his views on war, poverty, jobs, campaign financing, income inequality and crime. The video covers Bernie Sanders from 1985-2015, which covers a span of about 10,957 days. Bernie Sanders is addressing crime in relation to poverty and jobs, while Hillary Clinton’s “tough on crime” narrative is dealing with the people who commit crimes and not the socioeconomic conditions that lead to crime, which is a narrative that must be scrutinized. When politicians say they want to deal with the “real problems” of crime without addressing structural oppressions that lead to crimes, they are really saying they want to “deal with” (see incarcerate) “the people” (see black and brown youth) who commit crimes. Her remark could have been improved if it were given in reverse order: Let’s address the conditions that create gangs, before youth of color are indiscriminately thrown into jail. The lack of such a distinction is alarming, and we should find it troubling that the CBC PAC has recently received money from a lobbyist to Corrections Corporation of America, a corporation that manages private prisons. In 2010, The American Civil Liberties Union and the ACLU of Idaho filed a class action federal lawsuit charging that officials at a Idaho Correctional Center promote and facilitate a culture of rampant violence that has led to carnage and suffering amongst prisoners at the state-owned facility operated by Corrections Corporation of America. Since the CBC PAC and Hillary Clinton have claimed money doesn’t influence their politics, I am sure they will support a bill Bernie Sanders introduced into congress called Justice is Not For Sale Act of 2015, which aims to eliminate federal, state and local contracts for privately run prisons. There have been numerous reports that show private prisons exploit the poor, and according to a 2014 study the racial disparities in private prisons housing state inmates are even greater than in publicly run prisons. Sanders’ actions regarding civil rights and issues important to the African American community has been documented thoroughly. Mother Jones has extensively covered Bernie Sanders’ activism during the civil rights movement. In 1962, he protested police brutality, and he was arrested for protesting segregation in public schools in Chicago. As a member of congress, Bernie Sanders’ record on civil rights is clear. Sanders introduced The National Priorities Act of 2007 to congress, which addresses poverty and income inequality, and he has found success by amending legislation, which included an increase in accountability for corporate crime, expanding free health care, and gaining a $22 million increase in funds for the Low-Income Home Energy Assistance program and the Weatherization Assistance program. Bernie Sanders has also introduced the Ending Federal Marijuana Prohibition Act of 2015, which could help legalize marijuana, and lower the rate in which black Americans are disproportionately arrested for marijuana possession. Bernie Sanders also received a 97 percent rating by the NAACP in 2006 (an indication of his pro-affirmative-action stance). Not too bad of a record for a man who has been accused of being “thin” when it comes to civil rights issues. The problem with the CBC PAC endorsement is that it further continues the notion that because the Clinton name has black politicians, she will have us. This message in its nature is condescending because it assumes that any black politician who fought for civil rights has a monopoly on what’s best or who’s best for young, black voters. The last time I checked “being a friend of the African American community” wasn’t a viable campaign slogan, and for a member of a black caucus to use this language as way to get black Americans to cosign Hillary Clinton’s campaign is insulting. If Hillary Clinton is a “friend” of the African American community then she and the black politicians who endorse her must live up to criticism that a “friend” of the African American community and the endorsement of said friend ascribe for itself. Unfortunately, this is criticism that has yet to be seen. This does not mean that any criticism of black members of state is a sign of ungratefulness for the work black politicians have done during the civil rights movement. This is a call for us to unite against the establishment—both black and white—and demand that our representatives march to our anthems of progress, despite how radical they may seem and acknowledge that our vote for the Clinton Campaign is far from granted. Thank you for that. I actually don’t remember typing unite in unison. Not sure how that got in there. Thank you so much for catching that. I am still trying to figure out how unison made its way into the last paragraph. I guess that when you know you have to stop looking at the screen. Once again, you nailed it. Factual and eloquent. Thank you for saying that Lisa. I appreciate your kind words and your readership. I wish more people could get exposed to the research you’ve done, and understand sander’s history. I could be wrong but I feel like people will really regret not voting for sanders if they care about civil rights. My brother’s name is Josh! I agree people who care for civil rights should go for Sanders, but unfortunately many don’t know about his record. But hopefully the more people this is shared the more his record will be exposed. Thanks for reading. Alright dude, subscribed. The first article of your I read, with the health care statistics, told me that you were serious. I think these most recent two continue that trend, even if it isn’t as statistic intensive. Thanks for writing, and I’ll keep listening. Thank you for your kind words, Kyle. I really appreciate your subscription and readership. As a long-time supporter of Bernie Sanders, I am glad to finally see a fair treatment of his political history regarding crime and civil rights issues. I even learned a few things. I’m going to post the link to this article so others can become informed. Thank you. Thank you for reading, Bob. Share away! Great piece! Thanks for posting video from the CBC Crime Bill hearing in ’94. I was a staffer for Bobby Scott and was responsible for planning the hearing. I had forgotten about Bernie’s participation. Those were lonely times. You see how few Members are on the dais. On the crime bill vote, the true anti-crime bill vote was on the rule and not on the bill. On the first rule vote, there were only 10 of 40 Members of the CBC voting against the rule and effectively stopping the crime bill. On the second rule vote, about a week later, after extensive lobbying from the White House (!!!! ), 4 of the 10 gave up the fight against the rule. The six that voted against the rule, at the time, were considered the only true opponents to the crime bill. Interestingly, that vote bound many of them together for the rest of their careers. I believe the 6 were Bobby Scott, Maxine Waters, Lou Stokes, Mel Watt, Craig Washington and Bill Clay. So by my count, 34 members of the CBC sold out! Unfortunately, a similar dynamic is repeating itself today with the internal CBC battles on criminal justice reform. The bill being pushed by the White House, Booker, Conyers and Jackson Lee expands mandatory minimums and 3-strikes you’re out. Senator Grassley is on record saying his intention was to undermine real reform efforts like the bill sponsored by Bobby Scott and Sensenbrenner. Please, keep up the good work. Thank you for the feedback and encouragement. I’m trying to keep going, but it’s so hard. I can only imagine what it’s like in real politics. Part of the problem is that the mainstream media isn’t covering Bernie Sanders or the primaries in a thorough or informative way. The information I have posted here hasn’t been picked up by any major outlet or magazine! I don’t think my writing is so much better than others, but I think it’s about the information. I’ve submitted this article to NPR, Slate, The Nation, Salon, The Atlantic and Huffpo Live, but I haven’t heard anything… it’s only been a couple of days (I know it could take up to weeks to hear back, so I have t be patient), but I feel like the longer the media waits the harder it is to show voters Sanders’ true record. If you have any contacts, I humbly ask for your help with this effort. It’s not so much about electing Sanders (even though my bias towards Sanders is clear) as much as it is about having an honest discourse about candidates’ positions, policies and past efforts. Thanks for the information about the crime bill vote. The articles I read from the 90s didn’t do a good job of detailing the process or modifications of the vote, so I had to go with the conservative number, which I got from Jet (I used that source because most black folks know the magazine). I did read a few articles from the LA Times that talked to about lobbying that went on for the bill by the white house. Very interesting stuff. As a Sanders supporter I commend your efforts but if the Black community doesn’t get the message none of this will matter. As a white male who has lived through the Civil Rights era and Bill Clintons presidency, I’m continually shocked by the support he receives from the Black community. The Clinton’s agenda is strickly their own!! No relation to Max Landis? j/k Thank you for reading. You are right: if this isn’t shared amongst the black community, then it won’t matter. I’ve been trying to get the article out there, but I’m having trouble. Please share on your networks. Maybe we can change some hearts and minds. Thanks for this. It’s vital that more activists of color get this kind of analysis out into their communities before Hillary and the DNC establishment steal the nomination. Let’s hope it’s not too late. I’m subscribing to your blog and will gladly see to it that others get the word. Keep fighting. Thank you, Michael. I appreciate your subscription and readership. I will keep up the good fight on my end! I suspect that HRC bought in 100% to the fraudulent tales of “wilding” in the ’80s and would have happily helped convict the Central Park Five. Her language in the quotation above is deeply revealing: we bring animals to heel, not human beings.